As the first formal assignment of Edinburgh Napier’s MSc Publishing curriculum, the Books for Schools Initiative challenged groups of new students to connect with the wider community of Edinburgh through a book-driven outreach project. Acting as representatives of Merchiston Publishing, students were assigned a local area and asked to deliver a box of books to a school within that zone. 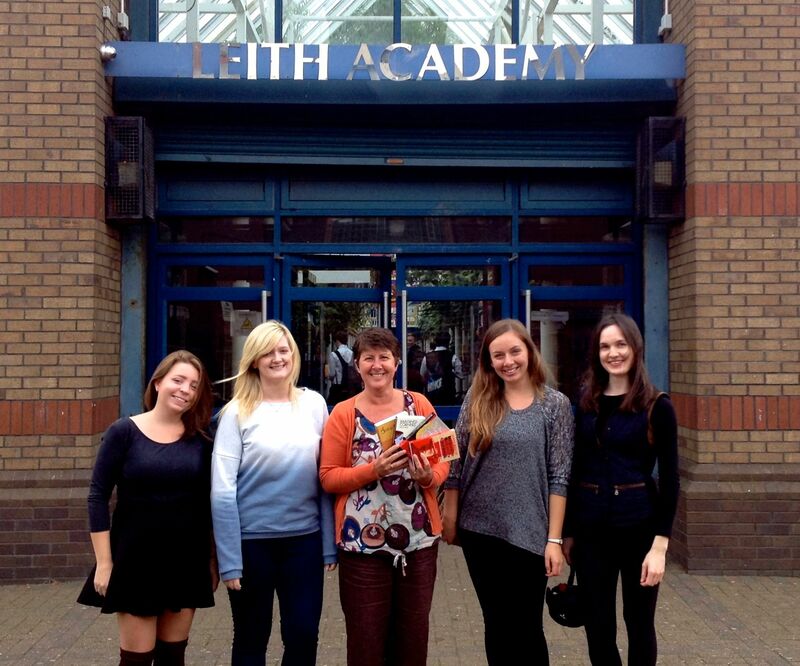 We had an extremely positive experience cooperating with Leith Academy in our allocated region of Leith, Edinburgh. Initially, we had considered multiple schools in the area in order to determine which would benefit greater from participating in the initiative. While researching potential recipients, we were very impressed by a series of student-written book reviews on Leith Academy’s website. We decided that this school’s emphasis on student engagement in literacy seemed particularly in line with the Books for Schools Initiative’s objectives. Our point of contact at Leith Academy was Christine Boal, the school librarian. She was happy to receive the books for the school library, and even told us that some of the titles in Merchiston Publishing’s catalogue, such as Sir Arthur Conan Doyle’s The Hound of the Baskervilles, are part of the English department curriculum. Unfortunately, we were not in a position to offer any copies of this particular book, but Christine was enthusiastic about the possibility of obtaining a class set of curriculum books from Merchiston Publishing should this become viable in the future. 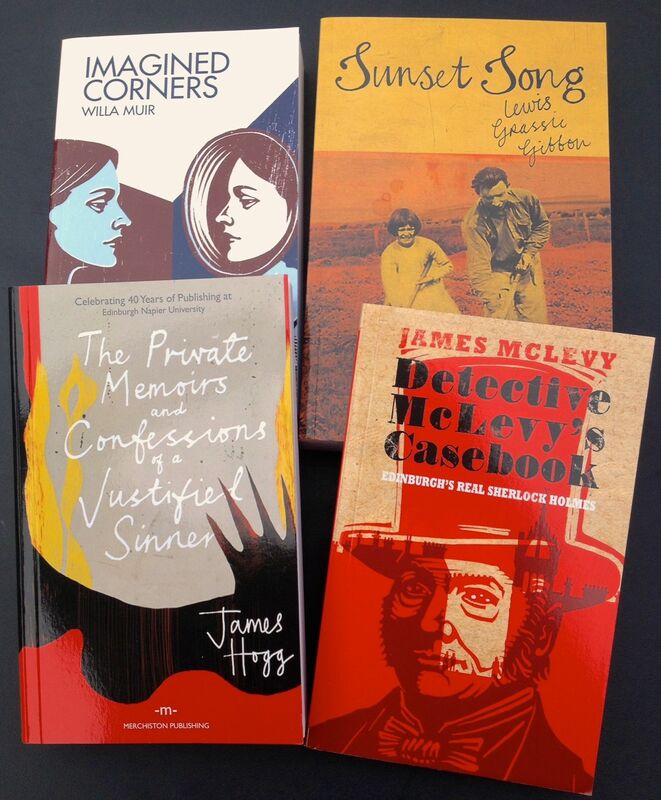 The titles that we hand-selected for Leith Academy’s library were The Private Memoirs and Confessions of a Justified Sinner by James Hogg, Detective McLevy’s Casebook by James McLevy, Imagined Corners by Willa Muir, and Sunset Song by Lewis Grassic Gibbon (Christine has plans to campaign for this particular book to be integrated into the school’s English curriculum in future terms). We were excited by the idea of bringing modern editions of classic Scottish literature into the school and offered two copies of each. On Tuesday, we journeyed to Leith (although this was not so much of an expedition for two of our members, who are originally from Leith and made the trip from campus by bicycle) to deliver the books. We finally met face-to-face with Christine, who was very admiring of the books’ updated, original cover art. We were very interested in the possibility of having students review the books for the Leith Academy website, and she planned to encourage students to do this. Christine also mentioned another student-focused project in which she hopes to incorporate the donated books, and we truly look forward to seeing how this pans out. We agreed to keep in contact regarding future developments and possibilities of further collaboration. We took a lot away from this assignment in terms of becoming somewhat familiar with the various roles that people fill in the publishing industry, as well as the importance of deadline-oriented planning. Additionally, we gained an appreciation of the demanding nature of group work, something that will certainly be relevant throughout the course of our degrees and careers. Thanks again Christine and Leith Academy for your cooperation and enthusiasm! We look forward to hearing how your students benefited from the Books for Schools Initiative.